Sir David Attenborough will officially open the Yorkshire Museum’s major new exhibition Yorkshire’s Jurassic World on Friday March 23, with the exhibition opening to the public on Saturday March 24. 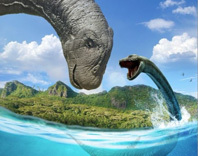 The 91 year old naturalist and television presenter will take a guided tour of the exhibition which looks at the changing landscapes of Jurassic Yorkshire and the huge creatures which inhabited them. York school children will be asked to submit questions about the natural world and Sir David Attenborough’s career to York Museums Trust, with the winners being chosen to come and ask in person. YMT Card Holders will also have the chance to win four pairs of tickets for the official opening of the exhibition – click here to find out how to enter.